Summer is usually filled with all things red, white, and blue for the 4th of July, so I put together some fun crafts and activities to keep little hands busy while strengthening those fine motor skills before school starts up in the fall! Reading and math take a back seat during the summer months as we find ourselves enjoying the beautiful summer weather. Don't get me wrong, we still do those things, but our school year "routine" flies out the window. No weekly themes, no lesson plans-- just "flyin' by the seat of our pants so to speak. However, we do still find time to make various crafts and art projects, which come in handy during the hot afternoons or after several days in the sun. Here's 12 simple and festive activities to work on fine motor skills this summer in preparation for the 4th of July holiday! 4th of July American Flag Craft using Dot Markers | My Mundane and Miraculous Life. Even the littlest ones can do this craft! Cupcake Liner Fireworks | A Little Pinch of Perfect. Great way to work on scissor skills over the summer! Add a festive red, white, and blue twist to this classic kid craft! Yarn Wrapped Stars | Fantastic Fun & Learning. Great way to introduce your little ones to "sewing!" Rolled Paper American Flag Craft | Little Family Fun. Bubble Wrap Fireworks |Sugar Aunts. Simple way to prepare your little one's for the noise! Torn Paper Stars | Frogs, Snails, & Puppy Dog Tails. No-prep craft for the kiddos! Search, Find, and Count Stars: 4th of July Sensory Bin | Little Bins for Little Hands. Red, White, & Blue Fruit Kabobs. Take a break from crafting and get the kiddos involved in making a delicious and healthy 4th of July snack! 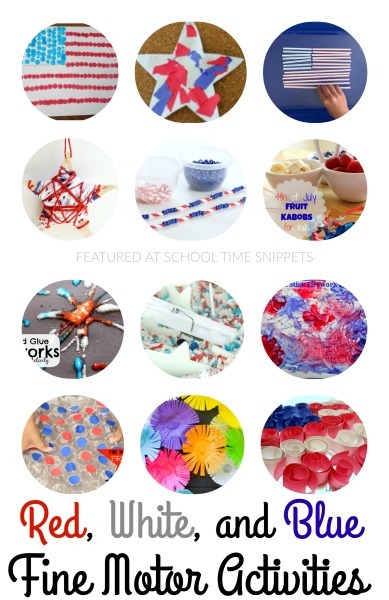 Enjoy the summer sun and all things red, white, and blue while keeping those little hands busy!